Hi. 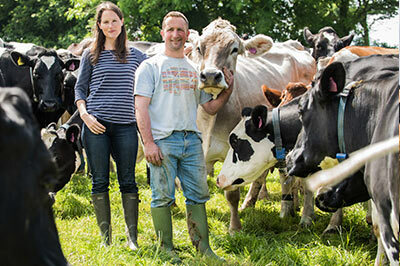 My name is Steve and my wife is Lizzie and, together, we run West Ash Farm, a 600 acre organic farm in beautiful North Devon. We are the 5th generation of farmers to work the farm, which was started in 1896. We became organic in 2001, because we believed that it’s a more natural and sustainable way to farm. We started to supply milk for Kingdom Cheese in 2015. In our 200 cow herd, we have a mix of breeds, consisting mainly of Friesian’s, plus some Norwegian Reds and Brown Swiss, which spend most of the year grazing outside .In addition we farm some beef on a quarter of the land.